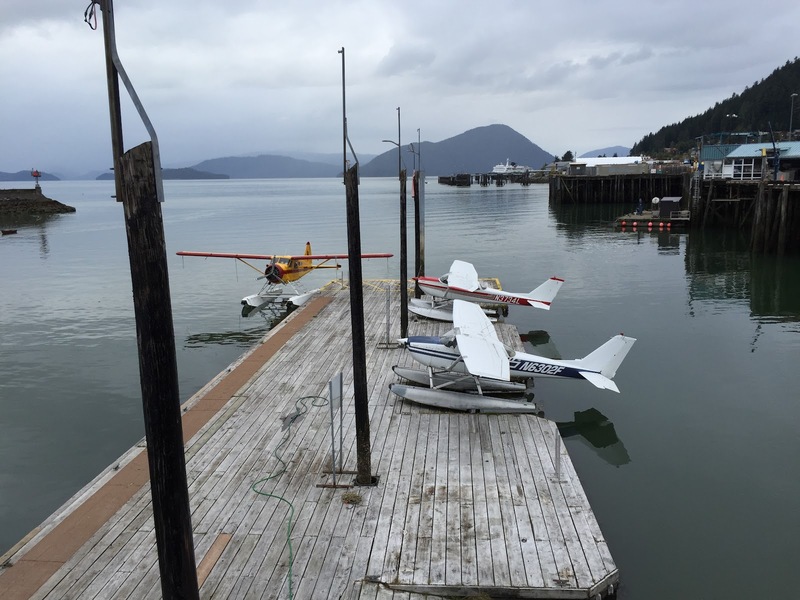 When we were planning our Alaska itinerary, we had to be a bit less flexible than we typically like to be, especially in the southeast, because of the modes of transportation available. 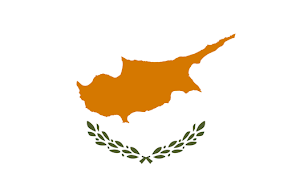 Towns in this area are located on islands, and there are no bridges between them. The only means for getting from one to another—unless you're on a cruise—is by air or the inter-island ferry. Since the ferry wasn't offering daily service and our schedule didn't mesh with its route plan, we were left with Alaska Airlines. Of necessity, each of the small towns in the southeast area has several daily flights in and out. 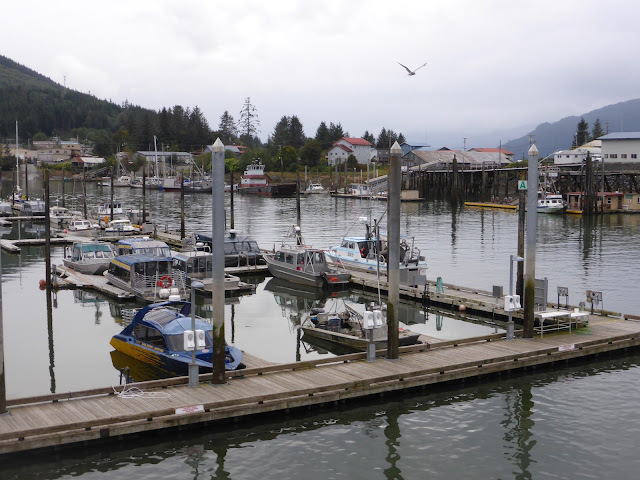 We wavered between Sitka and Wrangell for our next stop after Ketchikan when plotting our trip. 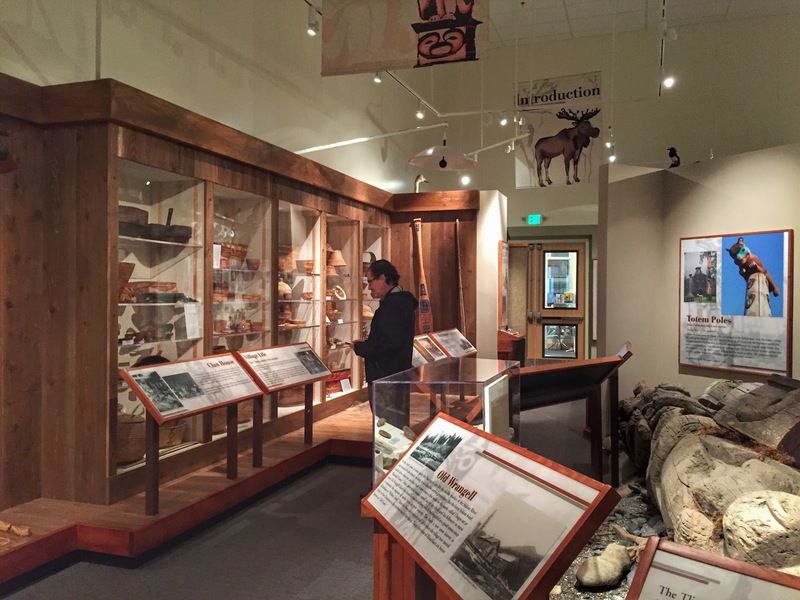 What finally put Wrangell over the top was the Anan Wildlife Observatory. Anan Creek is home to the largest run of pink salmon in the area, and this abundance of fish attracts hordes of black and brown bears who come seeking an easy meal. Bald eagles, sea lions, otters and other wildlife have also been spotted there. Though their primary "season" is July and August, we were assured by Forest Service personnel in the three times we called while planning our trip that we would be able to visit during the second week in September. 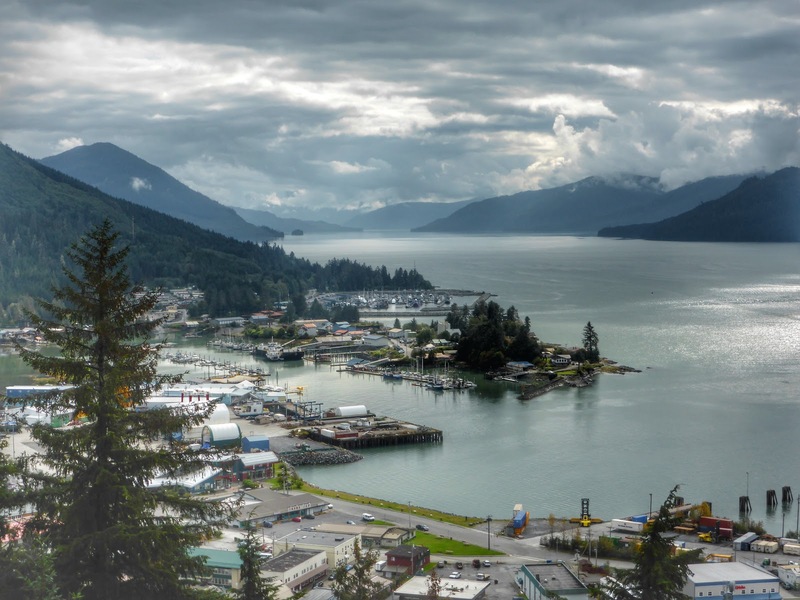 Except for this natural wonder, Wrangell (pop. 2,448) really didn't have much to recommend it in mid-September, so when we arrived on Wednesday and learned that the observatory was closed, we experienced a major case of traveler's remorse. It all began when we landed at Wrangell's compact little airport about 10:30 and walked across the parking lot to Practical Car Rental, the only automotive leaser in town. Since we had called from Ketchikan (there's no web site), the agent was ready for us with a red 2009 Toyota Corolla beater, complete with multiple dents and stained fabric seats lavishly decorated with cigarette burns. 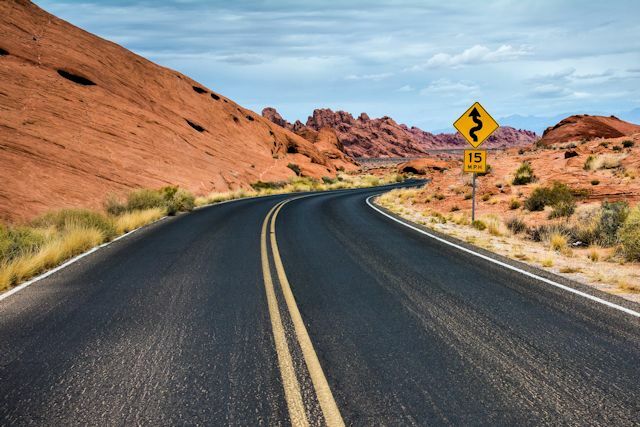 Upon our inquiry, the agent informed us kindly that no, we were not permitted to drive this pristine vehicle on forest service roads, leaving us a total of about 15 miles on the island where we could explore. 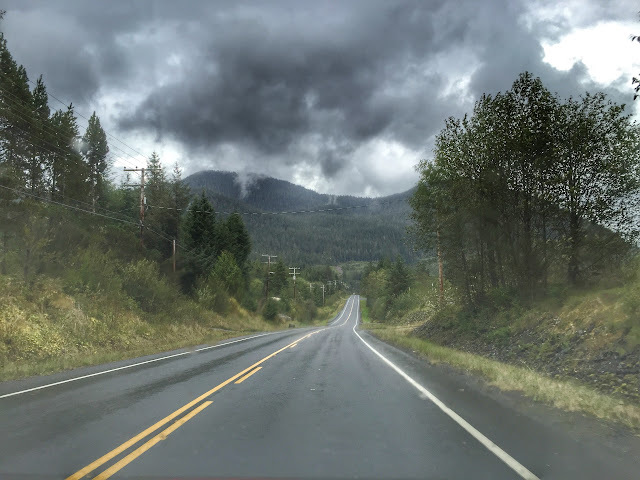 Our temptation to tour the unpaved roads anyway was restrained by the agent's story of sending a tow truck on multiple occasions to rescue cars with not one but two tires flattened by the extreme conditions on the forest roads. 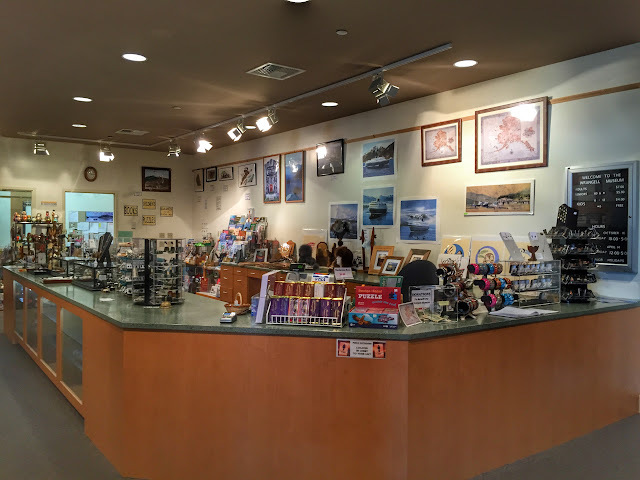 By the time we loaded our bags into what we were assured was the only car available, we were both hungry but decided to make the tourist information center our first stop before seeking lunch. Now that Anan was off the table, we had questions about what else we could see and do, and the TI was the place to find answers. Or so we thought. Housed in the surprisingly upscale Nolan Center—along with the local town museum and the civic center—the brightly lit and well-stocked visitor center appeared open for business. We browsed through the ample selection of brochures and chose some printed materials, expecting someone to show up any minute. But they never did. Eventually we wandered across the hall to the museum, which was similarly unstaffed. We heard a voice from a distant office in back, but never saw a soul. After 15 minutes of wandering and seeking in vain for assistance, we took off, following the information on one of our brochures to Java Junkies to hook up with a local outfitter for wildlife viewing somewhere other than Anan Creek. "Closed," said the sign on the Java Junkies door. And on the door of another outfitter next door, the same. Frustrated and hungrier yet, we consulted Yelp to find a local place for lunch. After Yelp basically shrugged, we settled on Diamond C and soon wished we hadn't. The vast majority of the offerings were fried, but there was a veggie burger on the menu. When I learned upon inquiry that the "special sauce" which made the burger so appealing (according to the server) was made in house with mayo, catsup and pickle relish, I asked for the burger plain. Apparently the person preparing this gourmet concoction considered my request the height of bad judgment and generously slathered on the sauce anyway. From lunch, we drove to the Alaska Sourdough Inn and checked in before going to City Market, one of two local grocers. As the only guests on site at the inn, we were treated to the oversized Harding River Suite with its gigantic bathroom complete with a four-person jacuzzi tub. To ensure we didn't accidentally take our room keys with us or lose them in the Clarence Strait, each key was equipped with a fishing bobber. Bobbers bulging in our pockets, we sought out the grocery store and stocked up on enough food to keep us out of Diamond C and its compatriots for another four meals. Knowing that rain was in the next day's forecast, we set out to explore what there was to see in Wrangell. 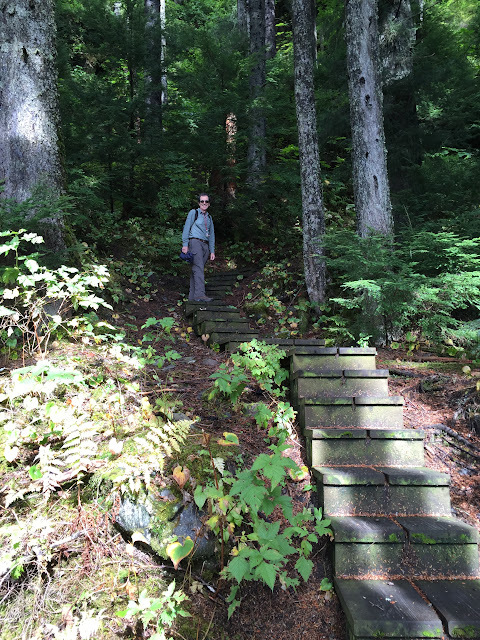 Our first stop was the Mount Dewey Trail. 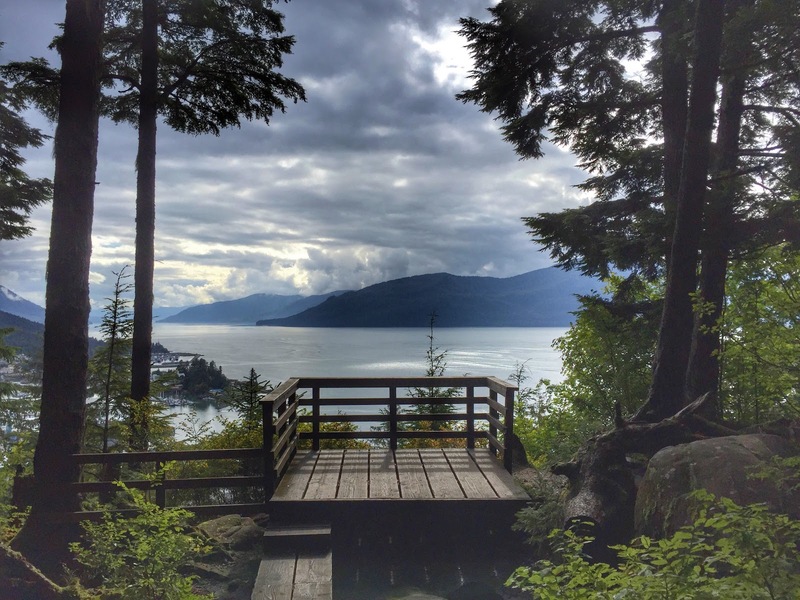 Beginning on rock steps, the 0.4-mile trail quickly transitioned to a raised boardwalk interspersed with sections of wooden steps winding up and around Mount Dewey through the lush vegetation and towering trees of a temperate rain forest. The lung-testing 400-feet climb to the summit rewarded us with a scenic vista overlooking the town and port. At the top, we planted the final installment of our Carmen Sandiego series of letterboxes begun in 2012. With Alaska in place, we now had planted at least one box of the series in each of the 50 states plus the District of Columbia (not to mention the UK, Netherlands, Luxembourg, Italy, France, Switzerland and Belgium). The alliterative clues were both challenging and fun to write, but we were content to close the door on the project. When we returned to the car an hour later, we drove to the ferry terminal and were thrilled to locate a never-before-found letterbox hidden nearby in 2010. 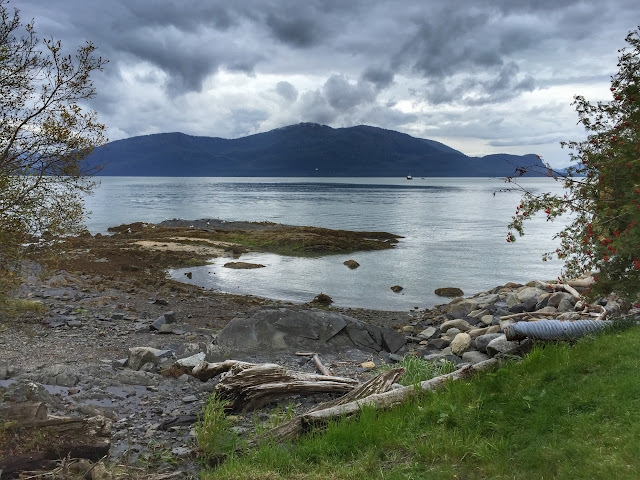 From the ferry, our next stop was Petroglyph Beach, widely promoted as a signature Wrangell attraction. 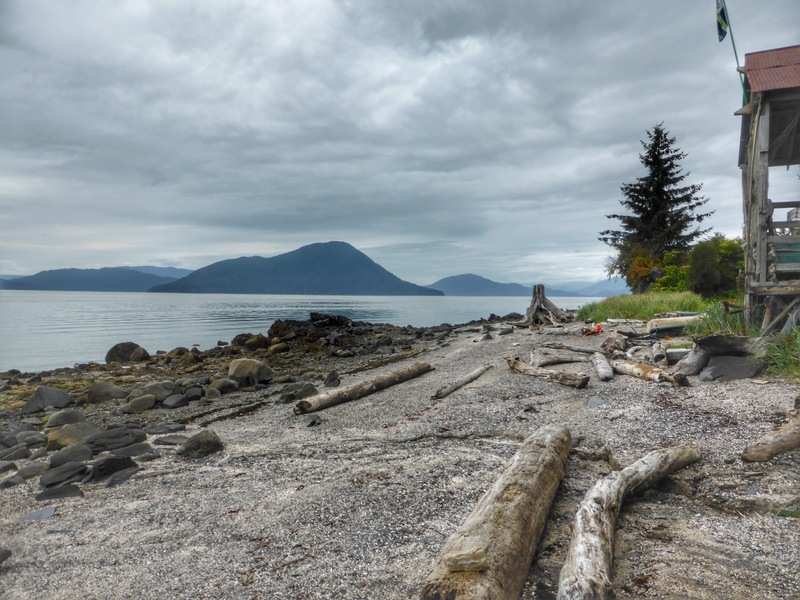 In fact, the small beach area is a protected state historic site which is said to boast as many as 40 of “the best surviving examples of Native artistic expression” in southeast Alaska. Though we visited at the recommended low tide, we were unable to locate a single design or symbol pecked into the rocks on shore…except the replicas put in place for those who insist on taking rubbings. 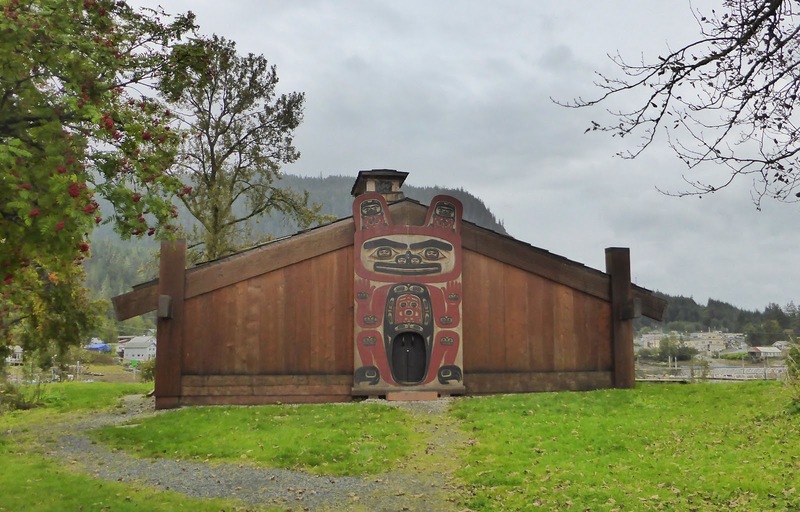 After coming up empty at the beach, we headed over to Shakes Island, a small grassy islet in the city’s inner harbor, which is home to a reconstruction of a Tlingit tribal house and several totems. From 1840 to 1940, the island served as the home of a line of local leaders bearing various numerical titles of Chief Shakes. A sign indicated we needed to pay to cross the pedestrian bridge to the island, but seeing no toll collection container or official, we walked across to find, as we expected, that the clan house was locked tight. Perhaps summer visitors receive a warmer welcome. Finally we returned to the lodge, cobbled together a meal from our grocery store finds, and began planning for the next day. Before long, the rain that had been threatening most of the day began to patter on the skylight above our heads, and we were soon lulled into bed and sleep. Thursday’s forecast called for 100% chance of rain, 100% of the day, but we sallied forth from our room about 9:30 anyway. 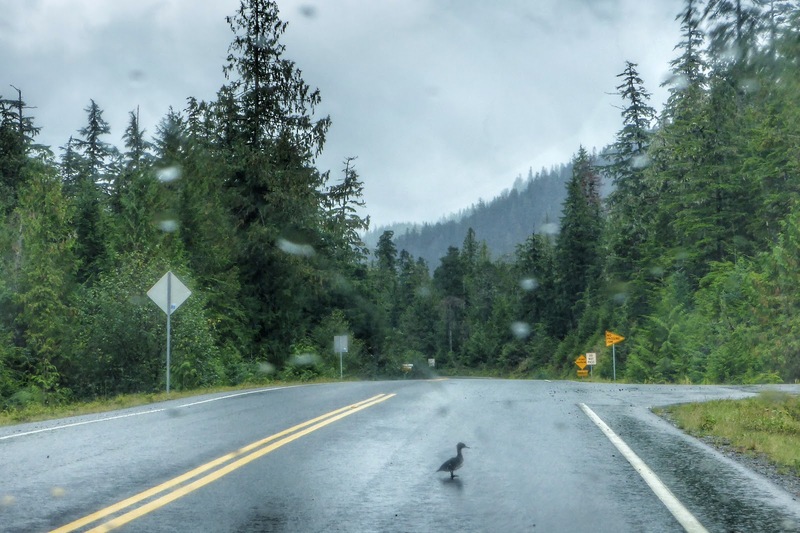 The main item left on our list of Wrangell places to visit was hiking up to Rainbow Falls on a steep trail—a no-go in the rain, but we still had not seen the museum and, of course, there was the ever popular “driving to the end of the road” tour—only 14 miles this time. With the town located at the northern end of Wrangell Island, our road trip took us only south. After a stop at the Shoemaker Bay Harbor, we continued down the road. Near the end, we found a duck sitting in the middle of the right lane of the road. As we approached his location, he would fly forward a few yards and land again in our lane ahead. After we reached the terminus and turned back north, there he was again. Always, he would be in the lane we were driving in. Finally he seemed to grow tired of the game of tag and flew away. Our silly fascination with this odd anatine behavior reflected the dearth of things to do in and around Wrangell on a mid-September day. 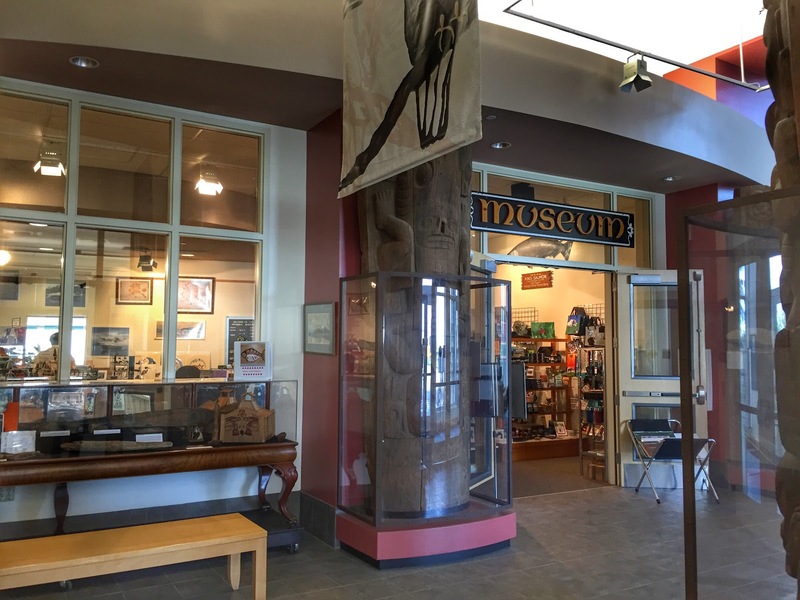 Back in town, we found a staff member at the Wrangell Museum and paid our $5 senior admission fees to enter. Exhibits were quite well designed and related a very thorough record of Wrangell history with an admirable collection of authentic artifacts. After lunch in our room at the lodge, Ken returned to the museum. Having learned as much as I wanted of local history and having my fill of dodging raindrops, I remained to work on plans for Juneau. Regretting that we missed Sitka, we will depart from Wrangell tomorrow on an Alaska Airlines flight through Petersburg to Juneau. Float planes at the downtown harbor looked like toys. 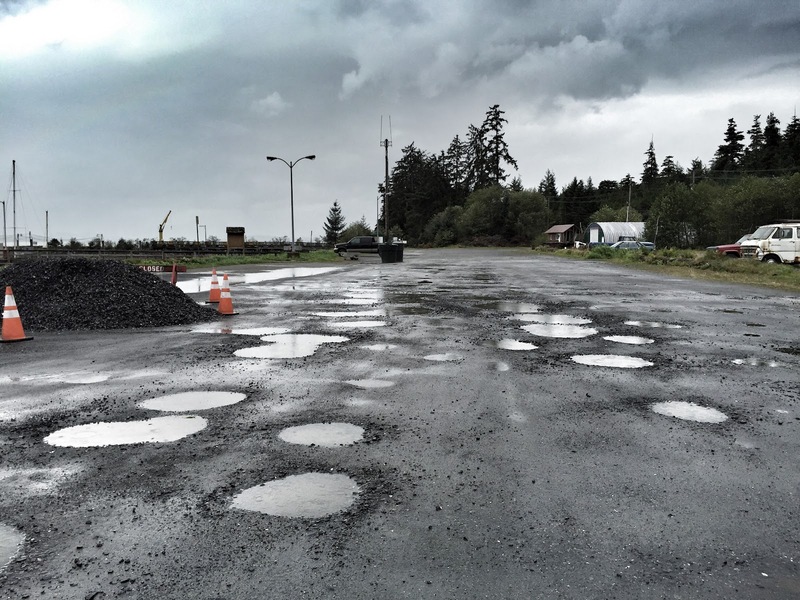 Got potholes? At the parking lot for the Shoemaker Bay Harbor...yes!